The Philadelphia School district needs $304 million dollars to close a budget gap and Tom Corbett hasn’t exactly come riding to the rescue. Prior to signing the state’s budget the Governor said that he is willing to dedicate $127 million to help the struggling schools. This plan is $40 million less than what was requested by Philadelphia’s school reform commision. Corbett insists though that he is providing more than the state’s fair share. 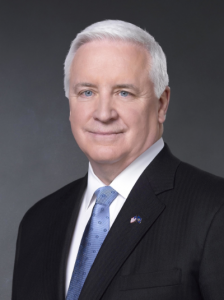 “This budget once again places education as our highest priority, accounting for 41 cents of every state dollar,” Corbett said. The $127 million dollar plan comes from three separate bills, each with its own set of requirements to be met. $45 million will come from a one-time state contribution. WHYY Newsworks reported that the money will be given on the condition that the district annually receives certification from the Secretary of Education that, “the district has enacted reforms that will provide for the district’s fiscal stability, education improvement and operational control.” What this means has not yet be directly specified. $50 million will come from borrowing against a sales tax extension granted to the city. The governor predicts $30 million will be recouped in property tax collection when the state passes stricter laws for Philly. Another $15 million is actually money that was set aside as a part of the regular budgeting process. $133 million dollars is also sought from the governor in terms of labor concessions. The action may have prevented the district from laying off 3,859 employees, which was supposed to go into effect Monday, but there is no guarantee for how long. “Due to draconian budget cuts, the public schools of Philadelphia are being starved to the point where they can no longer function for the city’s children. Philadelphia is in a state of crisis. We believe your direct and public intervention is required to ensure the existence of educational opportunity in that city,” said Randi Weingarten, president of the American Federation of Teachers, and Diane Ravitch, an education expert in a letter released Monday. Moves by the city to raise revenue through a $2 dollar per pack cigarette tax were advanced by the Senate, but the House declined to move on the legislation. Reasoning was revealed by Senate Majority Leader Dominic Pileggi (R-Delaware). An education reform group in favor of vouchers and charter schools commissioned a poll – leaked in June – that showed Corbett could improve his poll numbers with a rescue package for Philadelphia schools. Keegan Gibson contributed to this report.